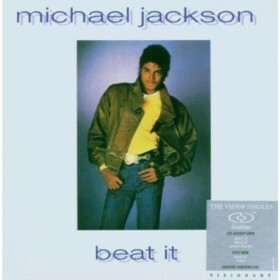 Beat It is a song by Michael Jackson in the Rock genre. It was released in 1982 by the Epic Records label. The artist's official site can be found at www.michaeljackson.com. Beat it...just Beat it yeah. This is a classic. One of the best songs of all time and by the King of Pop Michael Jackson. This song has a very upbeat catchy rhythm and features great lyrics as well. The way Michael starts the song off slow and then kicks it up into overdrive is awesome. The music video is also quite amazing and I recommend anyone who has not seen it to watch it ASAP. This site and its content are ©2008-2019 reviewtome.com. All Rights Reserved. This site is provided as a service to the general public as an entertainment review resource. Entertainment reviews are written and submitted by registered users of this site. These reviews do not reflect our opinions and we take no responsibility for the content of the reviews and ratings submitted by our users. Please Contact Us with any questions or concerns you may have.